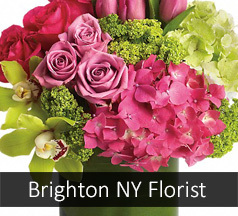 Rockcastle Florist has been proudly serving the Brighton New York area since 1951. We offer gorgeous farm-direct flowers, plants and gifts. Purchasing farm direct offers many great advantages to us and to our clients. It ensures that we can always offer the finest, freshest, highest quality floral products in the Finger Lakes area. The fresher the flowers, the longer vase life our arrangements provide to our valued customers. We offer a 100% customer satisfaction guarantee with every flower arrangement we create and deliver.